During PAWorld17, attendees will have the opportunity to listen to and meet a large variety of HR analytics practitioners from across the globe. Some attendees will have HR backgrounds, some statistical, some technological. Some will have just started their people analytics journey whilst others are circuit regulars. All of them though, are planning and growing impactful people analytics functions. What makes some People Analytics functions more successful, how can we measure and compare them, and how can you replicate them? What makes some functions more successful than others? 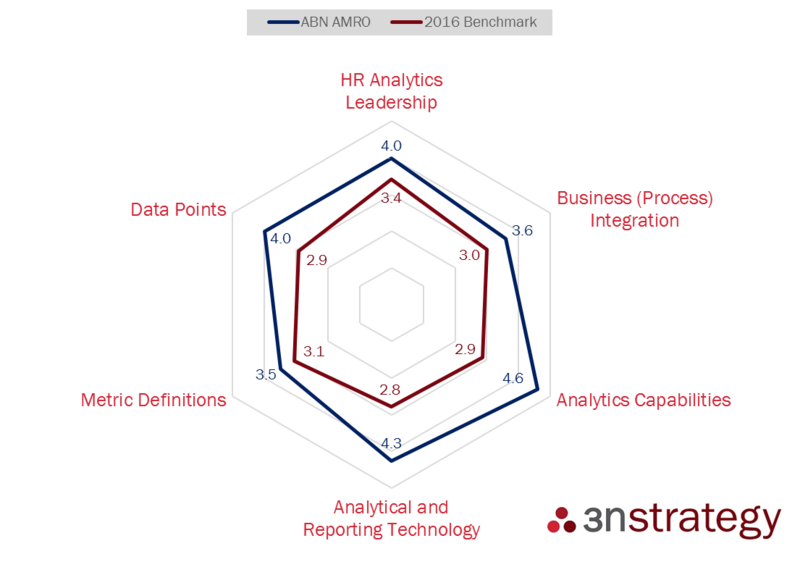 What is a successful people or HR analytics function? Is it a function that has the technology and capability to move from descriptive to predictive to prescriptive analytical techniques? Is it describing your function as a 'business driver', having transcended beyond being a 'service provider'? Their use of analytical and reporting tools to find insights and curate an HR analytics experience that precipitates action. Whilst all people analytics functions invest in each of these six areas, the most successful will not only have a plan for how they invest in each area, but will also have a plan for when they will make that investment. What is The People Analytics Journey? 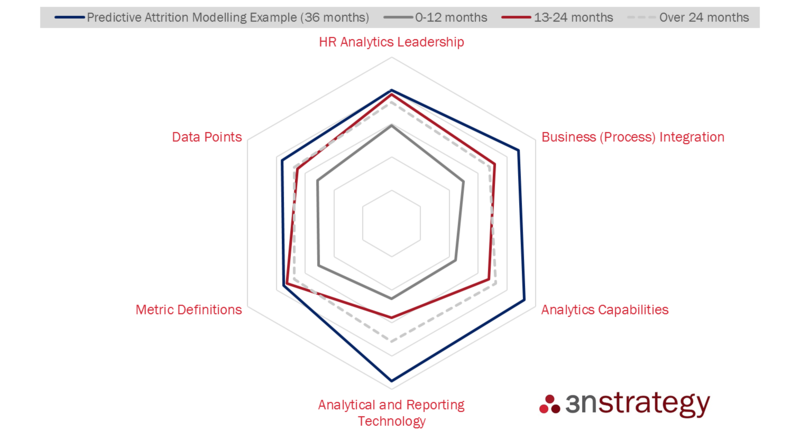 Every year 3n Strategy carries out an analysis of People (or HR or Talent or Workforce) Analytics Functions - in fact the first time was whilst sponsoring this same conference two years ago. The study looks at how strongly an organisation has invested in each of the six areas, at what point in the journey, and the full analyses also considers why. The tool and methodology for this study is the same one being used for the People Analytics World conference benchmark being conducted from the 3n Strategy stall. Our time benchmarks show that most functions grow across time, although there are clearly specific time periods where capabilities versus time periods when technology investments are made. What drives People Analytics success? Our research indicates that different types of investment are required for different types of goal. For example, organisations carrying out predictive attrition modelling to support business partners have subtly different setups from MI functions who are adding additional insights to help all line managers. However, the finding that was consistently true for all organisations was that the more advanced functions had a very clear understanding of the service they were providing to the business, and that their senior most stakeholder clearly understood it too. 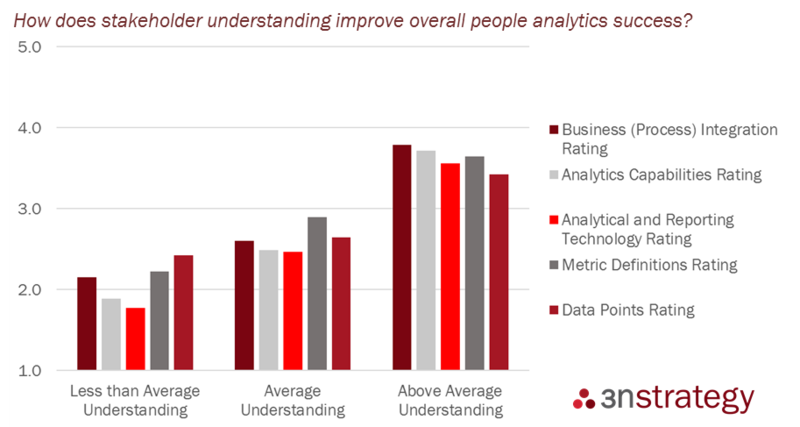 In fact, people analytics functions that were sponsored not only by senior HR figures (which was the majority), but senior stakeholders that understood the value which analytics creates, had significantly stronger profiles than other functions. Compare your People Analytics function with industry benchmarks. Throughout the two-day conference, 3n Strategy will be conducting a mini benchmark study on conference participants. All participants will receive a profile highlighting their strengths and weaknesses, and will contribute to the benchmarks that we will highlight during our session Analysing the Benchmarking Results from PAWorld17 on day 2. We invite you to come along and hear the benchmark results, and maybe compare them with your profile. When speaking to technology vendors, consider their impact on your overall function profile. Many technologies will impact more than one area of the profile in a positive way - how will certain technologies help your function both directly (technologically) and indirectly (improving processes and so on). Can you justify earlier investment to achieve a stronger profile sooner? What should you analyse first? Our research indicates a strong relationship between the areas of HR being analysed and the overall function strength. Some areas of HR - for example competencies - require greater overall maturity. Which (and how many) areas of HR is your function equipped to analyse? Where are the quicker wins? Could you be helping HR make more comprehensive decisions? 3n Strategy will be conducting a People Analytics World mini benchmarking study throughout PAWorld17 from stall 15, or you can take part by clicking here, or by emailing us at info@3nstrategy.com. The results will be presented back at 'Analysing the benchmarking results from PAW2017' session on day 2.